Fortunately, in most rehearsal and performance situations I find myself in this isn’t really an issue. Auditoriums and rehearsal halls that regularly have brass performers in them are pretty much used to the little pools of spit, I mean, water in the brass sections. As long as you’re not emptying them right where people will step, it’s not worth worrying about. Be aware, though, that even just a little moisture can make a patch of floor slippery, so don’t empty your spit valve in areas where people are likely to be walking. Trombonists, you will want to be aware of where your slide will be while playing and suggest to those woodwind players sitting in front of you that they may not want to put anything underneath. A little bit of water will drip off of your spit valve as you play and whatever music, purse, case, etc. the players in front of you put down will likely be “christened” by your spit valve during the course of the rehearsal. There are some halls where emptying your spit valve will be more of an issue. A lot of the churches I perform at have carpeting down in the area where I sit and they are keen on keeping it looking nice with minimal effort. The Land of the Sky Symphonic Band keeps a set of small towels that we take to performances so the brass players can throw them down on the ground and empty their spit valve onto them. I keep a small towel in my trombone case for situations like this. When I’m rehearsing at someone’s home I will either use my towel or sometimes just empty my spit into my case. I wouldn’t intentionally spill a glass of water on someone’s floor, so I will go out of my way to avoid emptying my spit valve unless they specifically give me permission. When performing in a solo situation, either in front of an ensemble or in a recital situation, I think it’s classy to not call too much attention to emptying out your spit. I will turn slightly to the side and without any fuss empty my spit out behind me. It’s more subtle and less distracting than unceremoniously blowing all the water out in full view of the audience, many who may not have any idea why you’re doing that. This also has the benefit that it keeps the spit away from where most people are likely to walk, especially important if you’re sharing the recital with other performers who may slip on your puddle if you’re not careful. Let alone the conductor, if you’re performing a concerto with an ensemble. Beyond that, it’s mostly just a matter of being aware of your surroundings and being polite. While I admit it’s fun to sometimes make fun of the string players and woodwind players aversions to the puddles we leave on the floor, they typically understand it’s part of the price we pay for playing the instrument we chose and will leave us alone about it as long as we keep it confined to our area. Now can we please just get the woodwind players to start being more careful about where they leave their broken reeds and string players to quit spreading their rosin dust around? Those are much more serious issues than a little water on the floor! while looking up Google entries for “spit valve”, I came across your interesting article. Where the water lands is the only issue that manually operated spit valves and the JoyKey have in common. 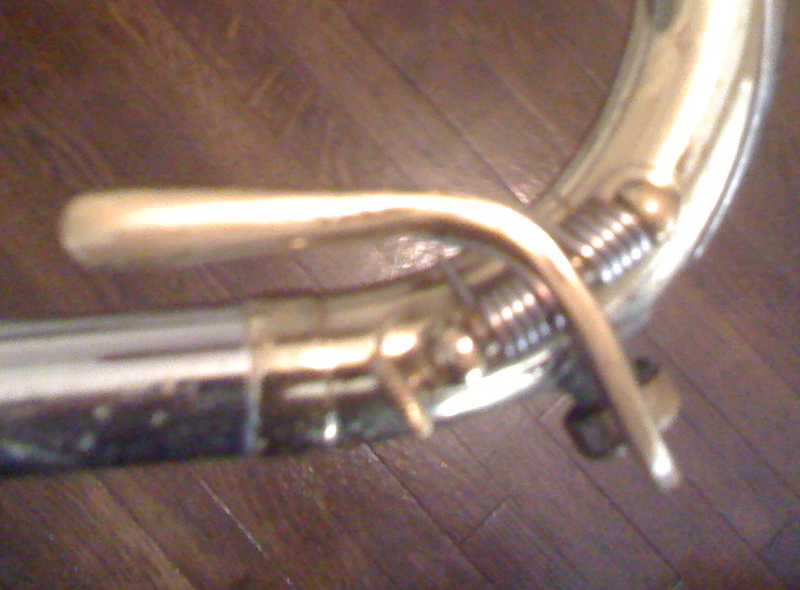 ﻿﻿I have been trying a recent product for brass instruments called the JoyKey. It is a replacement for a spit valve and automatically drains saliva from the horn without the player having to empty it manually. Good Day, I have stumbled across your article quite by accident, and would like to say that your attitude is barbaric. First, let’s make a clear distinction between water and spit. You are dumping spit on to the floor. Is spit water? No more than urine is water. What concert hall would appreciate me taking a steaming piss on their floor? None, sir. How difficult would it be to empty your spit into a small container? Even the towels that you only deign to use when in carpeted churches are better than the floor, yet you act like other musicians are somehow weak or squeamish for thinking that it’s bad form to dump spit on the floor? You and all your ilk are savages. Take this attitude to rock and roll, you reprobate. I suspect you’re being tongue in cheek. I was a bit in my post above too, but I stand by the gist of what I wrote. First, let’s make a clear distinction between water and spit. You are dumping spit on to the floor. Is spit water? I fair amount of what comes out the “water key” is, in fact, simply water put inside the horn due to condensation. Frankly, I think there’s more sanitary risk due to the inside of the horn rather than from any spit, so you still may have a point. What concert hall would appreciate me taking a steaming piss on their floor? None, sir. Have you ever heard the tune, “Buddy’s Habit?” Look up what the title is about. How difficult would it be to empty your spit into a small container? Well, it does depend on the circumstances. If I was playing the trombone section of an orchestra, it would be possible, but I don’t know how much it is worth the effort, to be honest. I’ve never had a stage hand complain, but then again I’ve never gone out of my way to ask. Regardless, it is “industry standard” protocol. Any concert hall stage hand is going to end up having to pick up broken reeds and sweep up string rosin after any given concert, but you’re going to complain about a little moisture that dries up after 20 minutes? My guess is that you’re a string player. If so, you need to go play fiddle with an Old Time band and get corrupted some. On the other hand, as a soloist you don’t want this distraction of having a small container up there. If I don’t want to have to stoop over too much to aim my spit valve it would need to be a fairly large bowl. In my blog post above I discussed some ways to make emptying the spit valve less of a distraction to the audience, and the key (no pun intended) is to do it as unobtrusively as possible. It seems to me that bending over a lot on stage (particularly if I positioned the container behind me) or putting a large bowl on the floor in front of me to solo creates a pretty obvious distraction when you want the audiences attention on the music. I’ll continue to do as I have been. We all must suffer for our art. Okay, for the record, the water isn’t pure spit. It’s condensation from the players breath, and it builds up as you play. It’s not like the brass players are just spitting into their instrument and emptying it out. It is definitely not the same as peeing on the concert hall floor. It’s a couple of drops of water, not human waste.